Hillary Clinton is vetting the FBI agents investigating her to make sure they cannot be blackmailed by politically-motivated individuals leveraging sensitive personal information about them. 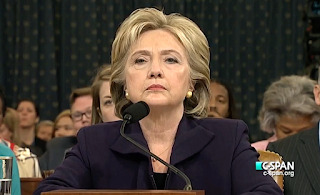 WASHINGTON (The Nil Admirari) - Earlier today, the campaign of former Secretary of State Hillary Clinton confirmed reports the Democratic presidential frontrunner was vetting the FBI agents investigating her use of a private e-mail server while she headed the State Department. The campaign asserted it wanted to make sure the people investigating Clinton were fair and incapable of being blackmailed by nefarious political actors utilizing unpleasant information about their personal lives. "Secretary Clinton wants to make sure she is being investigated by those who have solid ethical backgrounds that lack any embarrassing personal baggage politically-motivated individuals could use against them," explained Brett Slayermen, a senior Clinton campaign aide. Slayermen continued, "The Democratic presidential frontrunner deserves a fair investigation, and has the right to defend herself from people who may have details about their personal lives they would rather have the public not know about." "So, in a way, Secretary Clinton is doing the FBI agents assigned to investigate her a favor by discovering information about them that other, less moral people, could use against them," asserted Slayermen. An unidentified member of the press asked Mr. Slayermen if Secretary Clinton was indirectly threatening federal law enforcement officials with blackmail in order to end their investigation of her. "That is absurd," replied Slayermen. "I don't know anything I have said that would even hint Secretary Clinton wants to get leverage on those threatening her presidential aspirations."